Ancient Balinese legend describes a host of powerful spirits who help poor rice farmers achieve success. These farmers have long used a sophisticated irrigation system to organize rice cultivation by integrating religious devotion and social responsibility with traditional farming methods. Even modern farmers seek to placate the spirit world in their quest to produce an abundant harvest. Easy-to-read rules. Download the rules here. Players roll the dice before their turn. Players can choose all dice showing one symbol type – laborer (or two laborers), water, weed, card, or wild. Image shows handmade die – final dice will be resin and have enamel-painted faces. Tracks turns, shows rice gained when harvesting and display rain for the current season. Each player is dealt a random setup card which tells him where to add rocks to his field, and what assets to begin the game with. Water is tracked in players’ paddies using water discs. Only a limited number of discs are available each turn. Weeds clog fields and reduce the rice produced at harvest. Laborers can clear weeds if there is no water in the paddy. Weeds are wooden pieces in the game. These tokens are placed in a paddy when it is planted. A paddy must contain water to be planted. Rice Dice is a streamlined dice game version of Spirits of the Rice Paddy. 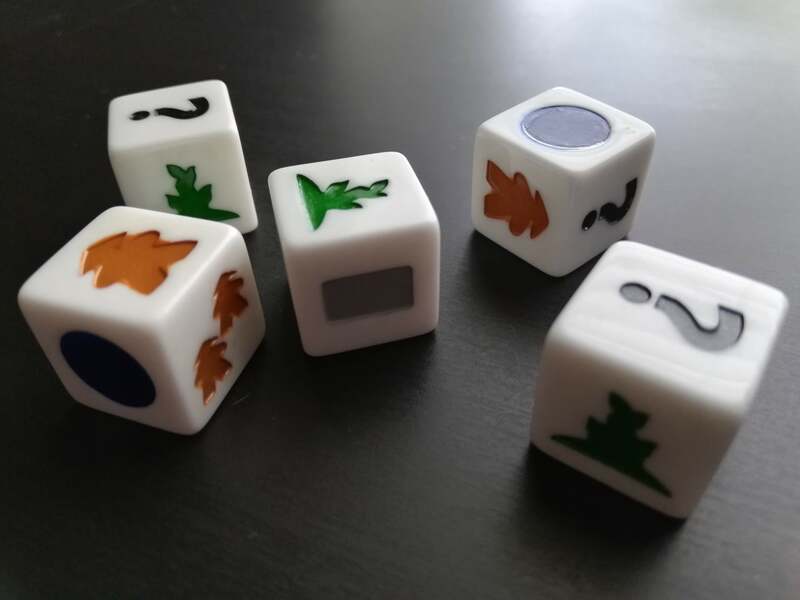 Players familiar with that game will feel at home with Rice Dice. New players will find Rice Dice to be a great introduction to its big brother. 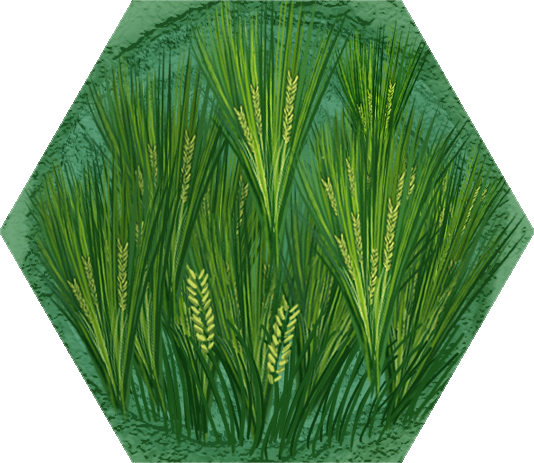 Roll the custom dice and choose one action based on the results: Add rice paddy cards to your field using the card action, run water through your paddies, or assign laborers to plant and harvest. Harvesting gains players rice, which is essential to winning, but paddies with weeds produce less rice so it’s essential to assign laborers to keep paddies clean. A harvested paddy can once again be flooded using a water action; and the cycle of planting, draining, weeding, and harvesting begins again. Players can re-roll their dice, but add one weed to your paddy for each weed symbol result! The first player to collect 100 rice (via harvesting, or other special abilities) wins! Like Spirits of the Rice Paddy, Rice Dice rewards a player’s ability to optimize the process of flooding, planting, weeding, and harvesting. But it plays in just a fraction of the time! If you're looking for a great dice game or you're looking for a streamlined version of the Spirits of the Rice Paddy game, then check out Rice Dice. Certainly if you like the original game and want to play it in much less time, I'd highly recommend this. [It] does a surprisingly good job of shrinking down and encapsulating all of the gameplay of its big brother, "Spirits of the Rice Paddy." In addition to designing the awesome Spirits of the Rice Paddy, Philip duBarry designed Black Orchestra, Skyway Robbery, Revolution!, Courtier, and several other board games and expansions. Philip has been playing and creating games since childhood and has done so on a professional basis for about the last several years. Q: Does Dishonorable Gift mean that I can add weeds to an opponent’s field? A: There are other paddy cards that allow you to add weeds to an opponent’s field. Dishonorable Gift makes sense if you have on of those. Q: May I remove weeds as a worker action on the same turn it was placed? A: Yes. You may place the weed at any time during your turn. You may also remove the weed at any time during your turn. Q: Can the ‘?’ wild symbol be used as some other symbol that I didn’t roll? A: Yes. For instance, you can use ‘?’ as water, even if you didn’t roll any other water. Q: For Happy Farmer, does the double worker count as the most-rolled symbol? A: The double worker counts as two single workers when determining the most-rolled symbol. Q: Does the Happy Farmer gain 5 points if he cannot fill all of his paddies? A: The Happy Farmer gains 5 points if he cannot add any water to his paddies, which means filling at least one paddy with water. Q: Can more water be stored in paddies than what is needed? A: No. This means paddies with magic water may only store enough water to fill the non-magic water hexes. Q: Can multiple meeples sit on the same space on the scoring track? A: Yes. The spaces are small, but you can lay the meeples on their side and stack them if necessary.